Research work on the Koyna Dam, India. The 103m high mass concrete Koyna Dam is one of the largest dams in western Maharashtra, India. Located in Koyna Nagar, the dam supplies water as well as cheap hydroelectric power to neighbouring areas. 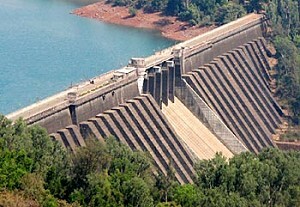 It was constructed in 1963 as one of four dams built as part of the Koyna project. It has the largest catchment area of all the dams in the region, forming the Shivajisagar Lake with a length of 50km. In 1967 the dam was subjected to a magnitude 6.5 earthquake. Accelerometers on the site recorded the time histories of the event and a later survey showed that cracking had occurred in parts of the dam. Due to the availability of field data the Koyna Dam has been the subject of a number of studies since the seismic event. One, of many studies carried out by the University of Wales in Cardiff, UK, on the dam used LUSAS Civil & Structural to investigate the dam's response to changes in numerical concrete cracking models. The aim of the study was to derive a concrete cracking model to allow for dynamic cyclic loadings and produce results that closely matched those of the experimental data. LUSAS was ideal for this because it contains a material model interface which allows users to develop and research constitutive models for their own use. During a seismic event a variety of factors can affect the predicted response of a dam. Of particular interest is the unloading curve because when cracks open and close it is well established that the crack stress-strain curve does not return to zero but to some finite tensile strain indicating that particles have 'wedged' in the open crack. Using the derived concrete model, three analyses were undertaken with the same finite element mesh, time step, and material data. The only difference between the analyses being the shape of the softening and unloading curves. Bilinear softening assuming no wedged particles, and exponential softening both with and without wedged particles were investigated. For each analysis, gravity and hydrostatic loads were applied to the structure and a dynamic analysis was run applying the combined vertical and horizontal ground motions. The concrete model with exponential softening and wedged particles gave the lowest response overall both in terms of response spectra and peak accelerations. For cyclic dynamic applications it appears to be important to incorporate both a realistic softening curve and crack wedging behaviour into a numerical concrete model. Work on this study is continuing to see if other parameters also have a strong influence on dynamic structural response.